Exponential technologies offer enormous opportunities for building a much more efficient and productive financial system capable of efficiently driving global growth and well-being. This demands a profound transformation of the financial industry and threatens the survival of today’s banks. The present article begins with a consideration of how technological growth affects the economy and companies, and continues by detailing its impact on the financial industry. It then discusses the fundamental risks involved in the transformation that financial institutions must undergo. This final analysis is largely based on BBVA’s experience with the drastic transformation it launched almost a decade ago. Almost a decade after the financial crisis began in 2007, and after a massive and very costly cleanup and recapitalization—largely at the expense of the public sector, that is, the taxpayers—the global banking industry is passing through an even more difficult stage. More difficult because, while what was at stake in the previous decade was the continued existence of many banks, what is threatened today is the survival of banking itself, at least as we have known it for centuries. 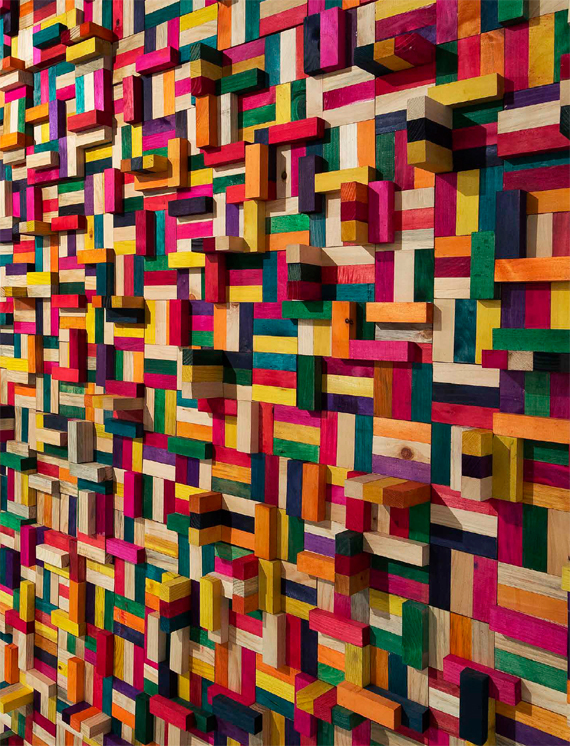 Dyed wooden blocks mounted on a wooden frame, Monclova Projects Collection, Mexico City, Mexico. The plethora of literature about banking’s current situation and perspectives frequently attributes this sector’s low and waning profitability and uncertain future to the more-or-less delayed effects of the crisis—including the maintenance by numerous banks in many countries of unproductive or non-performing assets whose balance sheet value far exceeds their market value; low economic, and therefore business, growth; more rigorous regulation, which has multiplied demands for capital and liquidity while reducing income from many activities; and most of all, negative interest rates in developed countries, which has had a deleterious impact on the profitability of banking operations. These unprecedented interest rates reflect powerfully expansive monetary policies initially intended to avoid a massive banking crisis and mitigate global recession and, later, to stimulate a recovery that continues to falter, even today. Another frequently mentioned aspect is the damage to banks’ reputations as a result of the bad practices that lie at the roots of the crisis. This is thought to have contributed to the lesser demand for banking services among broad sectors of society —especially the young—and their willingness to accept other alternatives to satisfy their financial needs (see, for example, European Central Bank, 2015, and International Monetary Fund, 2015). Still, at a deeper and more fundamental level, the greatest risks for the future of banks lie in the impact of the technological revolution and its far-reaching changes in the global economy and society. And this is not only true at a macro level—these changes directly affect people’s habits, needs, and demands in every part of their lives. Technological advances offer enormous opportunities for servicing these needs and demands—including new ones that will emerge as society and people continue to change—in a much more complete, perfect, and inexpensive manner. The drop in the cost of financial services will make it possible to offer them to all sectors of society, worldwide, including the most disadvantaged. Financial activity is the backbone of our economy and it is instrumental in handling people’s multiple needs and essential demands. Therefore, a much more efficient and productive financial system based on the most advanced technologies and able to respond to social changes and serve everyone can both benefit from and significantly contribute to the materialization of opportunities for progress and well-being offered by technological advances. This, in turn, requires a profound transformation of the financial industry, which has already begun, although it is impossible to foresee its long-range development. It is equally impossible to know what the entities that provide these financial products and services will be like, although they will almost certainly bear only a distant resemblance to today’s banks. The transformation of this industry threatens the survival of current banks, which will have to undergo a very complex, uncertain, and drastic process of adaptation if they want to be part of the financial industry of the future. In this article, we will review the possible effects of emerging technologies on the economy before considering their impact on the financial industry. We will then analyze fundamental aspects of the transformation which must be addressed by financial entities, their regulators and supervisors in order to adapt to their new surroundings. This analysis will necessarily draw largely on BBVA’s experience as an institution that has been involved with a process of radical transformation for almost a decade. Nick Bostrom’s well-known description of the technological revolution as “a dramatic change brought about relatively quickly by the introduction of some new technology” (Bostrom, 2006), makes it very clear that we are experiencing a transformation whose scale may well be comparable to that of the Neolithic revolution that ushered in agriculture and sedentary human settlements. Our current revolution, however, is immeasurably faster in its effects. The speed and pace with which today’s innovations not only emerge, but are applied and transmitted, is historically unprecedented. The speed of these changes in our time is due to the nature of the current technological revolution, which stems from radical improvements in the capacity, velocity, and cost of information processing and transmission. This contrasts with earlier technological revolutions that were based on the physical world and the production and transportation of merchandise. This technological revolution began in the mid-twentieth century with the development of the earliest computers, followed by personal computers and the Internet. Since then, it has certainly obeyed Moore’s Law, which states that the capacity to store and process information doubles approximately every eighteen months, while the cost is halved in the same period of time. This exponential advance was initially achieved by improving and reducing the size of devices, and it later burgeoned as ever-greater numbers of them were interconnected. That process has led to the emergence of “exponential technologies” whose name reflects their evolution in compliance with Moore’s Law. Many, such as “intelligent mobility,” which is the capacity for mobile computing, the cloud, big data, the Internet of Things, nanotechnologies, and the development of new “intelligent” materials, contribute to increases in the capacity for information processing while reducing costs in a way that supports the continued validity of Moore’s Law. Others, such as robotics and drones (or driverless cars), 3-D printing, virtual reality, and a variety of biotechnologies—many, associated with genetics, including “gene editing”—benefit from the exponential growth of information processing and storage to advance at previously impossible speeds. Brynjolfsson and McAfee (2014) suggest that the current technological revolution has led to the “second machine age.” The first one drew on the development of steam engines to surpass the limited physical capacities of humans or animals. The second draws on the development of computers to surpass the limitations of human intellectual capacities, at least to some extent, and with consequences that have yet to be seen. This final aspect is what distinguishes the current technological revolution from earlier ones; other elements such as technological acceleration, the emergence of related technologies that can be combined, their impact on productive sectors, society, politics, and human lives are not essentially different from what occurred in previous technological revolutions, but the magnitude and speed of change are not the same. The fundamental qualitative difference is that now emerging technologies make it possible to change what had previously been considered immutable fundaments of human nature: memory, cognitive processes, physical and intellectual capacities, and even mortality itself. These technologies raise questions as relevant for our species as the impact of a drastic lengthening of the human lifespan, or a coexistence with machines whose intelligence is comparable or superior to ours, leading to the possible advent of so-called “singularity,” where such machines would be capable of independently generating other machines of even greater intelligence. In any case, the power of these new technologies and their rapid spread is accelerating the transformation, not only of industry and business, but also of human customs and lifestyles, culture, and, therefore, society as a whole. At the same time, as with earlier technological revolutions, we are experiencing a shift in the limits of what is possible in the production and distribution of products and services, and that should be generating a notable rise in productivity and global growth. And yet, to the concern of many, global economic growth over the last decade has been very disappointing. Not only has the acceleration commonly associated with a technological revolution not taken place, but growth has actually been lower than in the previous decade, and far lower than in the twenty-five years following World War II, which were the most brilliant of the past century, and possibly of any time in history. And this is so despite the efforts of central banks, which have injected enormous amounts of liquidity into the system and lowered interest rates to unprecedented levels—even negative levels along a considerable length of the performance curve in Europe and Japan. The weakness of the economic recovery following the latest crisis and the scant optimism of growth forecasts for the immediate future have led to considerable debate among economists. The so-called “techno-pessimists” believe we are in a phase of stagnancy, trapped in a long period of negligible growth in productivity and employment and even the threat of deflation and lasting depression. On the other hand, the so-called “techno-optimists” believe we are in a transitional phase still affected by the consequences of the crisis: a prolonged and difficult deleveraging and a weakness that still characterizes broad segments of the global banking system. According the them, this phase will be followed by a period of much faster growth, driven by technological advances. About three years ago, Larry Summers (Summers, 2014) revived Alvin Hansen’s 1930s hypothesis of secular stagnation (Hansen, 1938), to highlight the structural scarcity of investment demand as compared to savings. Other economists, such as Robert Gordon (Gordon, 2016), explain low growth in terms of supply factors, especially waning innovation and the consequent low growth of productivity. Yet others, including Thomas Piketty (Piketty, 2013) and Joseph Stiglitz (Stiglitz, 2015), cite other analyses that blame increased inequality for permanently depressing aggregate demand. These explanations are not mutually incompatible and could occur simultaneously. The combination of a Keynesian scarcity of aggregate demand, a slowdown in productivity, and a growing concentration of wealth among higher-income segments would be more than sufficient to drag the global economy into a long period of low growth. Still, there are also powerful reasons to dispute such a negative conclusion. First, the demographic perspectives maintained by emerging and developing economies suggest improved productivity and investment profitability that are much more favorable, and these could absorb the excess of global savings and also spur growth in the developed countries. Second, there are well-known problems with how the GDP, investment, and productivity are undervalued by statistical measurement tools designed for a “steel and wheat” economy—rather than a “digital” one, where data and information are the key “inputs” and “outputs” of a growing portion of economic activity (Mokyr, 2014). If these biases were corrected, they might offer a different view of future growth. Moreover, as Mokyr himself suggests, technological revolutions develop and bear fruit over a long period of time, and often in unexpected ways. Economic history has taught us that earlier disruptive technologies such as the steam engine or electricity, for example, needed time to reach a turning point in which they became widespread and accessible enough for general and flexible use that included their combination with other technologies, thus radically changing both means of production and living conditions. According to Brynjolfsson and McAfee, digital technologies are reaching this turning point, which would mark the beginning of what Klaus Schwab (2016) calls the “Fourth Industrial Revolution,” in which the combination of very powerful technologies is erasing the traditional separation of physical, digital, and biological realms. Until now, those most benefitted by these advances have been consumers. Technology allows an ever-greater number of people to access new products and services that improve their standard of living. But as Brynjolfsson and McAfee have pointed out, this process can also lead to greater unemployment and, thus, greater inequality. Technological advances will lead to the loss of innumerable jobs as workers are replaced by machines or their jobs become unnecessary when technology allows people to attend to their own needs. This is not the first time in history that new technology is associated with increased inequality and unemployment. That was the guiding idea of early nineteenth-century Luddites, and Keynes himself coined the term “technological unemployment” in the 1930s. In the past, however, notwithstanding the inevitable catastrophic prophecies, new technologies eventually generated new kinds of employment that replaced lost jobs. This new work was also more productive and it improved the overall population’s living conditions, even in a general context of greater inequality. Still, those improvements only took place after a difficult period of transition. In our current circumstances, this period of adjustment could be long and difficult for broad sectors of the population, and potentially very conflictive. Ultimately, the global economy faces two major challenges, which are different but related: first, strengthening aggregate demand and correcting imbalances that burden short-term growth; and second, facilitating and limiting the costs of the transition to a new reality. Overcoming both challenges will require ambitious measures on a global scale, including a fiscal impulse focused on investment in infrastructures and a broad group of structural reforms to improve market flexibility, with particular emphasis on job mobility, facilitating the creation of new businesses, reinforcing anti-monopoly laws, stimulating R & D + i, and, in a way that can no longer be delayed, drastically improving educational systems and promoting social inclusion policies so that technological advances lead to greater growth and everyone has access to these opportunities for greater wealth and well-being. No matter why the impact of the technological revolution has yet to manifest itself as a clear improvement in global macroeconomic figures, there is no doubt that our way of life is rapidly changing, including our work, leisure, consumption, and social relations. Moreover, this is clearly driving radical changes in the productive sectors and the businesses that belong to them. Klaus Schwab concludes that we are at the beginning of the “Fourth Industrial Revolution,” which is being built on the basis of the “Third,” or digital, revolution, that began in the mid-twentieth century and is characterized, fundamentally, by the merging or combination of technologies that are erasing the limits between physical, digital, and biological realms. What Schwab calls the “Third Industrial Revolution,” including the advent of Internet and the development of digital technologies, had an enormous impact on those sectors whose fundamental inputs and/or outputs consisted largely of information: communications, the media, music, many distribution sectors, and so on. These industries have had to reinvent themselves and have made enormous gains in productivity and efficiency, generating new and better products that benefit consumers. With the “Fourth Industrial Revolution,” other sectors that focus more on the physical world and have already experienced notable changes but not disruptive ones are beginning to see how the combination of technologies allows them to meet their clients’ demands in entirely new ways that radically alter their value chains. These changes are brought into the market by new, agile, and innovative competitors who can successfully compete with established companies by improving the quality, speed and price of their products or services—in sum, by offering their clients a better experience. This most recent supply is tuned in to a burgeoning wave of “new” consumers who are developing novel needs and habits that change the nature of demand as well, largely through access to information and interaction from mobile devices. All of this is forcing companies to rethink the design, production, and distribution of their products and services, as well as generating profound changes in the companies themselves, and in industrial structures. The emergence of new competitors such as Airbnb or Uber in industries strongly based on physical activities or on-site attention to clients—hotels or transportation for example—shows that the technological revolution is no longer hindered by sectoral barriers, and no industry is safe from disruption.In his famous book, The Third Wave, Steve Case (2016) poses the same argument, suggesting that the technological revolution will occur in a series of increasingly profound and powerful waves. According to Case, the First Wave began in the 1980s, when the earliest Internet companies connected people to the web by creating the necessary hardware and software for a connected world. The Second Wave is responsible for the enormous changes we are now experiencing in our lives and surroundings, but it has not made core changes to the global economy. Today, we find ourselves at the beginning of the Third Wave, in which profound changes have begun to affect key sectors of the economy, especially those dealing with “physical” or “real” concerns, such as health, education, energy, transport, food, and so on. In my opinion, as I will explain further on, the financial industry should also be included in this list. This Third Wave will probably develop in a different and more gradual way than the first two, because it affects very well-established industries with highly complex production and distribution chains and very powerful companies—often multinational corporations—that are generally subject to wide-reaching and diverse regulation. Therefore, it will be more difficult for individual disruptive agents such as start-ups to have a significant impact. Instead, they will be more likely to associate or collaborate with established companies. A major challenge for established companies will be expanding structures that have been successful up to now to include technology, and doing so at the same time as necessary regulatory changes. Regulators, and in general, those with political responsibility, will play a fundamental role, because they can help make the adoption of new technologies more or less rapid and harmonious. A mechanism that is proving key for the spread of technology and its adoption by well-established industries is the development of technology-dependent platforms that combine supply and demand by linking multiple providers with clients, generating tremendous amounts of data, information, and interactions, and creating new services and completely new ways of distributing and consuming them. Developments associated with a “sharing economy” or the provision of goods and services “on demand” are clear examples of unprecedented changes in how transactions—and not only economic or commercial ones—are taking place among people. Today, the five most important companies in the world in terms of market capitalization—Apple, Google (or its holding company, Alphabet), Microsoft, Amazon, and Facebook are essentially platforms of this type. This should give us an idea of the magnitude of the tsunami affecting all stakeholders and all areas served by companies. First of all, it places clients at the center of all company activities. Finding the best way to make contact with them and improving their experience with a company are keys to surviving in this new setting. Technology is therefore an essential tool, as all products and services, including the most “physical” ones, can be improved in different stages of design, production, and distribution by adding “digital” characteristics that increase their perceived value for clients. The rapid proliferation of new technologies, their infinite possible combinations, the importance and enormous abundance of data and information, and the techniques for processing them to generate better information and knowledge demand new kinds of collaboration between companies with different capacities. And the radical change in business models means that the talents and skills required by companies, their manners of working, organizational structures and, on a more general level, corporate culture must all be profoundly revised, and in some cases even reinvented. Today, we cannot say where this process will take us, as it is just beginning. Especially when we remember that the new and most powerful technologies currently being developed will become the tools that drive scientific advances in physics, biosciences, computation, and the environment, and these, in turn, will lead to new technological applications. But even the technologies already available today offer a multitude of possibilities to further spur the period of change we are now experiencing, including the cloud and big data analysis, multiple advances in robotics, artificial intelligence, biotechnologies, new materials, biometry, 3D printing, nanotechnology, and natural-language interaction with machines. I am convinced that all of this will lead to an unprecedented wave of prosperity that increases well-being across the globe and allows us to confront humanity’s greatest challenges: environmental degradation, climate change, poverty, and extreme inequality, among others. It is impossible to know how all of this will work out, how long the period of adjustment will last for each of the different social and economic sectors, or the degree of conflict involved. But we do know that all companies in all industrial sectors will be forced to profoundly revise their manner of working and doing business, generating a new culture that is open and positive in the face of change, and developing a willingness to question conventions and live in a state of continuous innovation. The financial industry—especially banking—has characteristics that make it a candidate for rapid and early digitalization, mainly because its fundamental raw materials and products boil down to two: data (or information) and money. And money can be turned into accounting figures, that is, data or information. Still, despite the fact that banking—and the financial industry in general—has changed considerably in recent decades, it has not suffered anywhere near the level of disruption experienced by other sectors. Different reasons for this have been suggested, including the conservatism of most people in matters of money, which leads, historically, to high levels of customer loyalty; the industry’s high growth rates and profitability, which tend to discourage experimentation and change; and what is almost certainly the most important element of all: regulation. The banking industry is subject to extremely detailed and broad regulation that limits institutions’ freedom to adopt radical innovations but also protects them from the entry of new competitors. But this is changing—first and foremost, because today’s clients are different. The crisis has undermined banks’ reputations and eroded customer confidence in them. Moreover, a new generation of clients has grown up in a digital marketplace, and it demands different services and new ways of accessing them. Furthermore, these new customers are more willing to accept banking services from other types of companies. And they are increasingly doing exactly that. Hundreds, even thousands, of start-ups are already attacking different links in banking’s value chain. These companies are not burdened by traditional banks’ legacy of obsolete, costly, and inefficient structures, and they are able to make the most of technology. Consequently, they can offer customers a better experience in a very agile, flexible, and inexpensive way. Payments, loans, securities transactions, and assets management are probably the most threatened banking areas, but there are also initiatives with considerable potential in insurance, deposits, risk management, cybersecurity, capital markets, and many other areas. The number, variety, and scale of these companies is burgeoning. A McKinsey report (McKinsey, 2015) estimates that they could cause banks to lose as much as 60% of their income in consumer finance, 35% in payments or loans to small and medium-sized companies, 30% in assets management, and 20% in mortgages. At the same time, the economic foundations of the banking business have changed. The high growth rates and profitability at the beginning of this century are definitely a thing of the past: the current context of very low interest rates could last for several more years and banking’s regulatory framework has become much stricter, with greater capital and liquidity requirements, as well as demands for transparency and consumer protection. All of this increases the need for an urgent transformation of banking to radically increase its productivity and efficiency. This transformation will generate enormous benefits for users in terms of the quality, variety, and price of its products. It will also allow many millions of lower-income people throughout the world to access financial services, thereby improving their standard of living and their opportunity to prosper. In macroeconomic terms, the transformation of banking implies a powerful structural reform: making resources cheaper, increasing the efficiency and agility of all services, and more precisely adapting them to users’ needs are all outstanding ways to help foster growth and reduce inequality and poverty (González, 2015). We are, therefore, headed toward a new and better finance industry, but we do not yet know what its final shape will be, or whether banks will occupy an important place in it. They may have no place at all. Bank branch in Tokyo near Tokyo Station, Japan. Banks have some clear disadvantages, such as very costly and inflexible structures, slow and complex processes, obsolete technological bases, and corporate cultures poorly suited to the digital world. Moreover, they are not close to those settings where the latest technologies and most disruptive innovations are being hatched, so it is difficult for them to access the talent that makes such activity possible. On the other hand, they maintain the immense majority of banking clients and they handle a great wealth of information about them. They have infrastructures that allow them to produce and distribute a broad range of products and services, and much greater financial resources, as well as the licenses required by regulations and, most of all, a profound knowledge of the financial business. The newcomers, however, are flexible, creative, innovative, and perfectly at home in technological settings, but they have neither clients nor the infrastructure needed to capture them. They lack well-established frameworks and experience in the banking business. Other potential competitors—major digital companies such as Facebook, Apple, Google, Amazon, and others—might be interested in entering the financial business to complete their offer to clients and to participate in an activity that generates repeated contacts with customers and a huge volume of information about people. These companies undoubtedly have customers, a brand name, and economic resources to overcome any problems generated by insufficient infrastructure or lack of experience in this business. Presently, however, the financial industry has not been one of their priorities, probably because they are reticent to enter such a tightly regulated sector. So far, digital competitors have attacked very specific segments of banking’s value chain and have been unable to develop a broad range of products. Even operating in this limited setting, they often rely on a conventional bank to make their products available to customers. So far, the major names on the web have made only relatively marginal incursions into the financial world. However, this will almost certainly change with advances in technological applications for that industry and changes to regulations in order to adapt them to the new setting. So banks have a certain amount of time to remedy their current weaknesses and assume a position that allows them to build on the advantages they still have. But this will require a long, costly, and, most of all, complex process that involves not only a radical technological renovation but, even more so, a profound organizational and cultural transformation. Three factors will be decisive in determining whether, in one form or another, banks will survive the technological revolution: first, the speed with which technology advances, and how fast it becomes a part of financial activity among both service providers, and most of all, clients. Second, regulations, which will be a factor in determining the speed with which the industry changes and, to a large degree, the direction it takes in many settings. And third, the speed, decisiveness, and success with which banks—at least, some of them—undertake the transformation process. We will briefly consider these elements in the following sections. What will customers want from the new digital financial-service providers? What customers definitely need is agile, rapid service—ideally, in real time—which is competitively priced and personalized, that is, adapted to their needs. And all this in a safe environment, where their data are protected. Today, that means providing clients with a complete omni-channel experience that allows seamless switching from one channel to any other. And, especially, the finest mobile solutions that make it possible to smoothly handle all aspects of any consultation or transaction. In any case, the customer’s digital experience should be complete, from beginning to end, for any service or product, and clients should also have the capacity to contribute to their design and to define their characteristics according to their own preferences. The security systems will have to be highly efficient yet agile, comfortable, and as unobtrusive as possible for the customer. Finally, customers will want to be offered other services beyond those associated with conventional banking. These new services have yet to be defined, but they will almost certainly include easy access to P2P systems so that clients can use their bank for any sort of interaction or transaction with other people. Today, these consist of payments and loans, but in the future they will include many other services. The technologies that make it possible to offer all of this already exist; their latest developments and growing adoption pave the way for changes we cannot even imagine, with enormous gains in the variety and quality of services offered and in the productivity of all operations. Mobile computing: smartphones that offer greater functionality every day and are increasingly becoming customers’ preferred means of accessing their banks. In the United States, over thirty percent of clients prefer mobile banking, clearly surpassing those who still prefer their branches (24%). Biometrics, which permits secure identification without need for documentation or physical presence, and thus eliminates one of the last obstacles to the development of complete digital banking on any sort of device. Cloud computing, which enormously facilitates digital transformation by making it possible to offer computer services in a scalable and very efficient manner to everyone. It is extremely advantageous in terms both of agility and cost and thus paves the way for accelerated cycles of innovation. The most important digital companies, such as Google, Amazon, Facebook, and Apple, have been built on these types of structures, and they even offer them to third parties in order to benefit from their enormous economies of scale. These are the infrastructures underlying the development of models for digital platforms that offer products and services supplied by different producers. Digital activity is growing at exponential rates, powerfully driven by mobile telephones, and increasingly by a multitude of other connected devices in what is now known as the “Internet of Things.” The information generated can be exploited, among other reasons, for better understanding the behavior of market agents. Big data analysis extracts information—in other words, value—from those enormous volumes of information at very high speeds. And big data also makes it possible to process very diverse kinds of information, both structured (statistics, indicators, etc.) and unstructured (web navigation flows, social media contents, etc.). Blockchain technology has enormous potential for change in the financial business. In a nutshell, it is public accounting among peers that requires no authority, central control, or intermediary (see Karp, 2015). This changes the rules of the game in many areas of financial activity, and other industries, for managing any kind of assets, whether digital or physical. It will encourage new business models that challenge the position of current banking by directly attacking its function as an intermediary. Moreover, it will make it possible to automate many banking processes that currently require intensive human involvement, thus generating new business sources. Another key technology for the development of banking will be “artificial intelligence,” or more precisely, “cognitive technologies.” These have the potential to drastically change how people live and, of course, how banking is done. They are actually a family of technologies with very diverse applications (Stanford University, 2016), ranging from routine tasks (the intelligent automation of processes), where they will ensure considerable savings, as well as improved quality and speed; to more complex tasks, where they stand out for their disruptive potential. These include the development of “conversational interfaces” that improve the users’ experiences; “Automated Complex Reasoning,” which permits totally automated decision making based on contextual and behavioral data and is fundamental for the development of “roboadvisors” capable of substituting for a human presence, even in complex operations; and “Deep Learning,” which paves the way for developing much faster and more advanced systems for fraud detection. As well as “risk scoring,” the definition of dynamic “clusters” of customers, the construction of artificial stress scenarios, and much more. Artificial intelligence is fundamental for the development of natural-language processing, which allows computers to maintain a conversation with human beings. This would enormously accelerate customer digitalization. All of this is already changing the financial industry. Largely because newcomers can attack concrete segments of the business, benefitting from some of these disruptive technologies and drawing on others for support to reduce the time and expense involved in establishing basic infrastructures for data processing, production, distribution, and so on. As a result, the financial industry is growing increasingly fragmented. Each year, hundreds of new operators join over twenty thousand banks that already exist, worldwide. At the same time, the industry is unbundling to the degree that these highly specialized new operators are breaking banking’s value chain by offering products and services focused on very specific links in that chain. Almost certainly not. On the one hand, the global banking system has been suffering from a clear overcapacity for years and, lately, it has also been burdened by scant income and a drop in profitability. This situation is worsening with the new competition, falling costs—and prices—ushered in by the technological revolution, as well as the technological and cultural difficulties that most banks are experiencing in their efforts to adapt to the new digital surroundings. Consequently, it is reasonable to expect many banks to disappear, along with innumerable start-ups, whose mortality rate is always very high. Thus, technological change will finally bring the drastic consolidation that the banking sector has needed for some time. On the other hand, user convenience calls for much more global and integrated solutions to their needs, and this points to a rebundling of the goods and services being offered. In such a complex and changing environment, rebundling will require combining products and services from different providers. Experience in other industries suggests that this will be achieved through platforms where different providers will compete and frequently cooperate to offer their users the best possible experience. These platforms will need a very convenient and user-friendly “front-end” that “knows how” to combine products and services to meet the specific needs and desires of each client at each moment. It is very likely that different types of platforms will develop, some to provide functionality to other businesses and companies that may even offer so-called “banking services,” that is, all of the infrastructure and processes needed to develop banking activity. Other platforms will work as meeting points or marketplaces for final clients. User convenience will probably impose a trend toward “universal” platforms offering an entire range of financial services along with others that are not financial. At the same time, or as a stage in the development of these universal platforms, there will also be many platforms specialized in different segments of the banking business, and they will be able to coexist and interact with the more generalist ones. Foreseeably, the number of such platforms will gradually decrease, due to the enormous economies of scale and scope that can be generated. So the key question is: who will occupy the center of these platforms the way, for example, that Amazon does today? This central player will be the platform’s “owner,” establishing the rules, taking responsibility for its maintenance and improvements, and validating the transactions that take place there. Consequently, it will receive a part of the income generated by those transactions and will have access to, and control of, the information generated around it, which is itself another enormous source of value. Evidently, competition for this position will be very stiff as the most successful start-ups—in existence or yet to be created—will have grown exponentially and will vie with those banks most capable of adapting to the new environment, and probably with some of today’s major digital enterprises. Succeeding in such a competitive environment will involve two fundamental conditions, although these, alone, may not be enough: first, possessing the most advanced capacities offered by the exponential technologies on which the platform is built; and second, being able to gain consumer confidence through an excellent reputation that stresses prudence, transparency, and a complete absence of conflicts of interest. Very few of today’s banks will attain this position, but those that do will have done so thanks to their decisive and successful adoption of sweeping changes. The rest will simply disappear. They will be absorbed or will fade away as their client base gradually shrinks. Some may even become infrastructure providers, offering their services generically to other companies with direct client relations. Historically, regulation has played a key role in the financial sector’s evolution. Its traditional objectives have been to guarantee the system’s stability, to prevent or minimize the effects of banking crises, and to protect consumers. Also, though less and less often, regulation has involved obliging banks to collaborate in attaining other economic policy objectives, such as industrialization, bolstering certain sectors, or even easing public debt. Encouraging competitiveness has only recently become a consideration for regulators and, of course, they have never been particularly interested in spurring innovation. Instead, they have frequently viewed financial innovations with misgivings, assigning more importance to their possible risks for the stability and/or protection of consumers than to their promise of better financial services at a lower cost. All of this, along with the manner in which regulation itself hinders the entrance of new competitors, has led financial systems to be slow in responding to technological advances and their resultant social changes, and their evolution has always been characterized by incremental innovation, with very few disruptive episodes. This is key to understanding why banking has lagged behind other sectors in its digitalization process, even though its characteristics make it a good candidate for an early adoption of such technology. This is changing, however, as regulators begin to recognize the importance of a competitive and efficient financial system for driving economic growth, for the well-being of its users, and for the stability of the system itself. Moreover, we are now encountering very powerful factors that contribute to this new perception, even if the transformation is quite gradual. One of these is exponential technologies’ enormous and ever more widely recognized potential to improve the quality, convenience, and cost of financial services, with significant advantages for consumers and for economic growth. And this potential is even more clearly perceptible in our present situation, when zero interest rates, or even negative ones, are proving insufficient to spur credit. Drastic gains in productivity fostered by technology will make it possible to transmit monetary policy, reducing the cost of capital. As a result, in recent years, different authorities have softened regulation in order to spur competition, especially in those segments of financial activity that do not directly affect its stability. This has favored the entry of new competitors in certain niche areas such as retail payments. Still, taking full advantage of technology’s potential requires much broader and more systematic regulation that today does not exist. This creates vast zones of high potential risk for the regulators’ basic objectives: macroeconomic and financial stability and consumer protection—including their data—as well as everything related to money laundering and the financing of illegal activities such as terrorism. What is needed, then, are regulations that adequately balance the value of new digital proposals for consumers with protection from the corresponding risks. Moreover, the dangers for macroeconomic and financial stability must be adequately weighted in the face of the increased efficiency offered by new business models. At the same time, regulation must create a competitive environment—and supervision must ensure that it is respected—in which similar financial products and services receive similar treatment regardless of what sort of institution—established banks or newcomers—is providing them. Fortunately, many regulators and supervisors are taking steps in this direction. There are, however, many areas to address and not enough resources available for adequate preparation. Therefore, regulators and supervisors must not only reinforce their “digital” human assets and strengthen dialogue with institutions that are moving ahead with digital transformation, they must also concentrate efforts on those areas that most affect the configuration of the future financial services industry. Among these, I would first like to briefly mention “digital enablers.” These technologies are at the base of almost every digital service and therefore require regulation to ensure their secure use. These include big data analysis, cybersecurity, and digital identification, that is, the development of secure and efficient remote identification systems. Second, there are technologies that can radically alter the configuration of the financial system’s infrastructure, including cloud computing and blockchain. Third, regulators need to think about how to deal with new and emerging business models such as alternative financing mechanisms (P2P loans, crowdfunding, online platforms or markets, and so on) as well as the different ways and degrees that “service banking” is provided. All of these elements stand out in a very broad and complex panorama of matters to be resolved, and they therefore require highly flexible and wide-ranging approaches, because “digital” financial innovation will always outpace regulatory review cycles. Moreover, inasmuch as financial activity is largely supraterritorial and easily relocated, these approaches must be global in scope. For all these reasons, future “digital” definitions and supervision will require a high degree of convergence and cooperation by responsible authorities in different countries, as well as constant, transparent, and constructive dialogue with the industry. How digital regulation and supervision are defined will be determinant in the speed and, to a large degree, direction of the financial industry’s transformation. Therefore, they will be essential to ensure financial and macroeconomic stability in the coming decades and to help convert the financial system into an engine of economic growth and improvement for the well-being of many millions of people around the world. Since then, we have made substantial progress although, of course, the process must be ongoing if we are to keep pace with technological change. Along with these advances, we quickly understood that transformation involves a much more complex process that encompasses all of our activities, human capital, and corporate culture. Advancing in all of these areas has also required changing our organizational structures. In 2014, we launched a Digital Banking division to handle the management of this process and accelerate the transformation. We rapidly saw significant progress and realized we could speed up our advances. As a result, in 2015 we adopted a completely new organizational structure that made transformation a key focus in all of our business and support areas with two fundamental goals: spurring results in all of the group’s business in the short and medium term and providing necessary resources and skills (both human and technological) to all of the group’s areas in order to successfully compete in the new banking industry. This structure has speeded our advance in new areas, products, and services, attracting new talent to expand our digital capacities and accelerating the development of a more agile, flexible, entrepreneurial, and collaborative corporate culture. This is already reflected in our working approach, which is increasingly oriented toward projects involving flexible and multidisciplinary teams, the expansion of “agile” methodologies, and the ever-broader use of “scrums.” The changes in our corporate culture and working methods have also been spurred by our new offices, which act to leverage the transformation, favoring collaborative work as a means of bringing out collective intelligence and stimulating innovation. Thus, our changing approach to work has been driven on three fronts: technology, culture (or behavior), and physical space. We have also strived to draw closer to those areas where new technologies and applications are being developed. We maintain various collaboration agreements with cutting-edge companies and we have developed an ambitious policy for investing in others that can provide us with special knowledge and capacities. At the same time, we have assembled teams to carry out very important research in fields such as design, the building of data architecture, big data analysis, process engineering, and so on. Herzog & de Meuron BBVA’s Corporate Headquarters in Madrid. 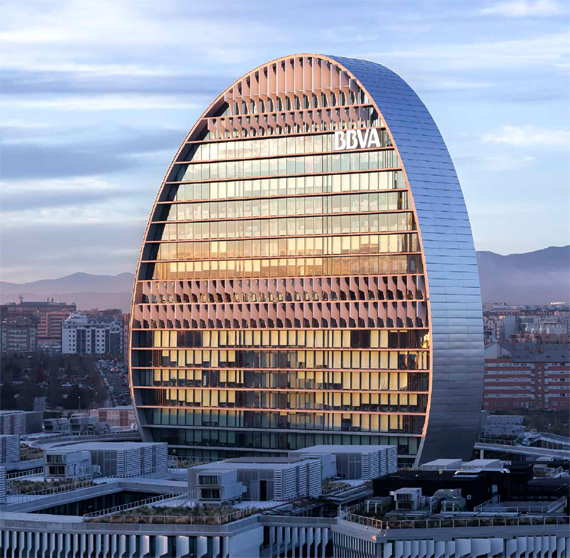 Known as La Vela, it is the icon of the new BBVA. Throughout this complex process, it is essential to remember that the ultimate focus must be on the client. Our efforts are aimed at defining our relation to our customers—on the one hand, by placing technology and information at their disposal, and, on the other, by concentrating our efforts on broadening and improving our relations with them. To do so, we must become a knowledge bank, using data to gain a better knowledge of our clients so we can help them understand their own financial needs and more easily make decisions, while providing them access to personalized solutions. And all of this in an agile, flexible and transparent manner, at the right price, to ensure our clients the best possible experience. This means redefining our value proposition, supporting our clients throughout their entire financial lives, and helping them fulfill their aspirations. It also requires directing our efforts toward democratizing our range of financial services, using technology to make them economically accessible to many millions of people who cannot afford them today. And that is what we call “exponential banking” at BBVA: banking that draws on exponential technologies to exponentially expand the area of contact with our customers and information about them; banking that multiplies both the variety and the quality of the services we offer; and, in sum, exponentially expands our business on a global scale. Such a drastic and powerful transformation can only succeed if it is guided by clear vision, committed leadership, and firm principles of prudence, integrity, and transparency to all of the company’s stakeholders. Because, in the final analysis, what matters is earning and keeping our customers’ trust, as that is what will determine who succeeds in the financial industry of the future. 1. For a broader, though undoubtedly less current, treatment of BBVA’s transformation, see González, 2014. — Bostrom, Nick. 2006. “Technological revolutions: Ethics and policy in the dark.” In Nanoscale: Issues and Perspectives for the Nano Century, Nigel M. de S. Cameron, and M. Ellen Mitchell (eds.). Hobokon, NJ: John Wiley, 2007, 129–152. — Brynjolfsson, Erik, and Andrew McAfee. 2014. The Second Machine Age. Work, Progress, and Prosperity in a Time of Brilliant Technologies. New York: W. W. Norton & Company. — Case, Steve. 2016. The Third Wave: An Entrepreneur’s Vision of the Future, New York: Simon & Schuster. — European Central Bank. 2015. Financial Stability Review. — González, Francisco. 2014. “La transformación de una empresa analógica en una empresa digital: el caso de BBVA.” In Reinventar la Empresa en la Era Digital, Madrid: BBVA. — González, Francisco. 2015. “Europa, entre el estancamiento y la revolución tecnológica. La banca digital como motor del crecimiento.” In La Búsqueda de Europa. Visiones en Contraste. Madrid: BBVA. — Gordon, Robert. 2016. The Rise and Fall of American Growth: The U.S. Standard of Living since the Civil War. Princeton, NJ: Princeton University Press. — Hansen, Alvin. 1938. “Economic progress and declining population growth.” American Economic Review 29: 1–15. — International Monetary Fund. 2015. 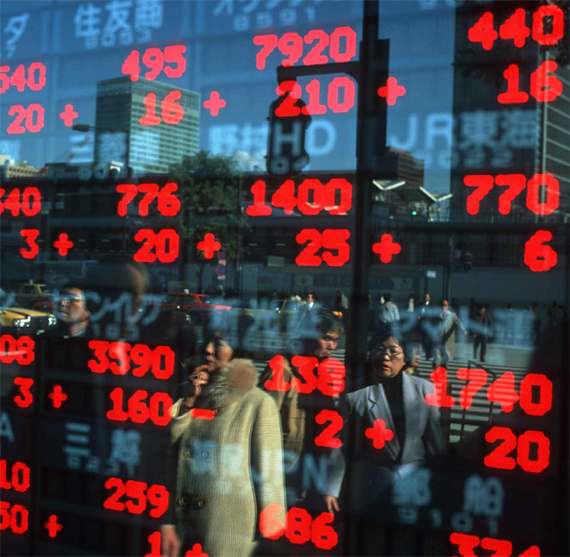 Global Financial Stability Review. — Karp, N. 2015. “Tecnología de cadena de bloques (blockchain).” Situación Económica Digital. — Lipton, A., D. Schrier, and A. Pentland. 2016. Digital Banking Manifiesto: the End of Banks, Connection Science and Engineering, MIT, Massachusetts Institute of Technology. — McKinsey. 2015. “The Fight for the Consumer.” In McKinsey Global Banking Annual Report. — Mokyr, J. 2014. “Secular stagnation? Not in your life.” In Secular Stagnation; Facts, Causes and Cures, C. Teulings, and R. Baldwin. London: CEPR Press, 93–90. — Piketty, Thomas. 2013. Capital in the Twenty-First Century. Cambridge, MA: Harvard University Press, 2014. — Schwab, Klaus. 2016. The Fourth Industrial Revolution: What it Means, How to Respond. Geneva: World Economic Forum. — Stanford University. 2016. Artificial Intelligence and Life in 2030. One Hundred Year Study on Artificial Intelligence: Report of the 2015–2016 Study Panel. Stanford University, Stanford, available at htpps://ai100.stanford.edu/2016-report. — Stiglitz, Joseph. 2015. Rewriting the Rules of the American Economy: An Agenda for Growth and Shared Prosperity, New York: Roosevelt Institute. — Summers, Larry. February 2014. “U.S. economic prospects: Secular stagnation, hysteresis, and the zero lower bound.” Lecture at the Economic Policy Conference of the National Association for Business Economists. Business Economics 49(2). González, Francisco. "The Next Step in Finance: Exponential Banking." In The Next Step. Exponential Life. Madrid: BBVA, 2016.